Thanksgiving is only a few days away. I am looking forward to it! It will be our third year hosting my parents, in-laws and brother-in-law at our house. 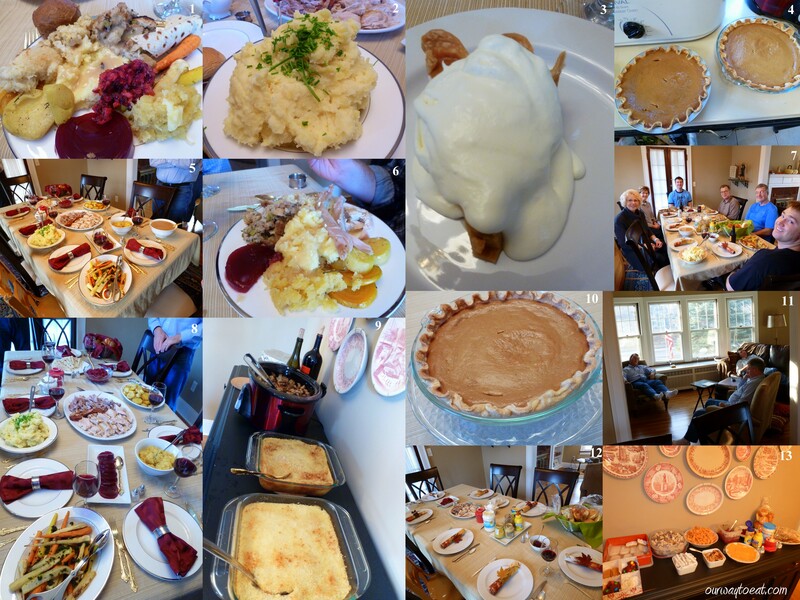 Thanksgiving traditions have varied and evolved throughout my life from being celebrated in October (in Canada) to having a large gathering at my parents house or Bjorn’s Aunt and Uncle’s to a smaller gathering at our house. This has become one of my favorite long weekends of the year being with both of our families, eating well, relaxing and having lots of laughs. 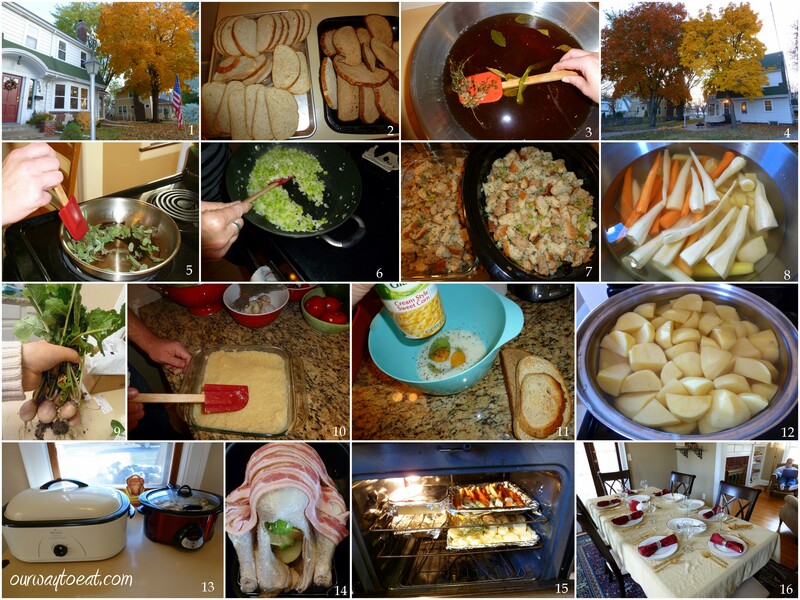 Here is a peek at last year’s Thanksgiving preparation and the resulting meal. It is also a reliable preview of this year’s anticipated event. There will some tweaks to the menu to keep things interesting, but we’ll serve our most-loved standbys to make sure everyone get their favorite traditional Turkey Day dish. 1. Our home from the front, framed by a gorgeous golden-leafed maple tree. This year all of our leaves have fallen and have been raked and hauled away. We’ve become much more zen about raking and hauling leaves this year. It is a huge job, but we’re used to it, and we enjoy being outside in the fresh air and we love these gorgeous maples so much. It sure is nice to have a cleaned up yard before snowfall this year. 2. City Bread, drying out for stuffing. City Bread is my favorite rye bread from Winnipeg which made the bulk of our stuffing last year. We’re due to visit the ‘Peg, our freezer is empty! 3. Last year I brined the Turkey using this recipe from Macheesmo. Everyone reported the bird to be juicy and flavorful and despite concerns, I was pleased that I could still make a tasty gravy using the drippings. This year I am not brining the bird. Bjorn is brining a bone-in turkey breast that he will smoke, so I’m skipping that step since my roast turkey will play second fiddle. I wouldn’t roast a turkey, but we simply must so that we can make gravy! 4. Our little house from the back, again the maple leaves last year were gorgeous. This year, with the leaves down the focal point of this view of our house is the new roof, which is cottage red. I love it, but I’m waiting for some finishing work to be done in front before I post pictures. 5. Toasting sage from the garden for my Mosaic Stuffing. I call my dressing Mosaic Stuffing because I clean out my freezer and use up the random loaves, rolls and bread ends that I’ve been hoarding in the freezer for the last few months. I love using a variety of bread with different flavors and textures as a basis for my dressing. I follow my Mom’s dressing recipe which comes together on the spot with her coaching. It is a simple recipe with bread, butter, sautéed onions, celery, salt, pepper, sage, broth and milk, similar to the recipe from the 1967 edition of the Betty Crocker cookbook but with some extra love and instinct as to seasonings, amount of milk and cooking time. We like it crispy on top and moist in the middle. 6. Sauteing celery and onions in butter for the stuffing. 7. Two pans of stuffing, one for today, and the next for the equally important Leftovers Meal, eaten tomorrow. 8. We round out our plates with a variety of roasted root vegetables: carrots, parsnip, and beets, coated lightly in olive oil and tossed with a generous handful of chopped fresh herbs. 9. Last year I grew one square foot of turnips which we saved for Thanksgiving. 10. Bjorn made the turnips into a Turnip Puff. It was a tasty vegetarian side dish, though it isn’t on the menu this year since we didn’t grow turnips! 11. Scalloped Corn is another Thanksgiving standby which will be repeated this year, except this year I am going to add more whole corn kernels as well as creamed corn and bake it in a cast-iron skillet. 12. We make a huge pot of creamy, buttery mashed potatoes because everyone loves them. I was very disappointed by the potato selection last year at Lunds– by the time I got there to shop, so many of the potatoes were green. This year I bought a bushel basket of Yukon golds from the Saint Paul Farmer’s Market. There isn’t exactly a crowd shopping at the market this late in the season, so I had my pick of potatoes and the friendly seller assured me they had just been dug and wouldn’t be green by Thursday. Shrinking the carbon footprint of our meal where I can, and having my selection of freshly dug potatoes is win-win in my book. 13. It is an all-hands-on-deck meal situation at our house. I haul out the roaster, use the crock pot and have every precious square inch of kitchen counter and table space in use to prepare this meal. 14. In contrast to the last two years, I bought a turkey from Lunds instead of from the Farmer’s Market this year. I haven’t had a lot of success buying a local turkey. I stood in line for two hours in 2010 to pick up a monstrous golden turkey, and could hardly thaw myself or get the bird cooked in time to eat the next day. Last year, our pre-ordered “fresh” local turkey was frozen and missing a wing. I’m willing to pay for quality locally grown meat, but when I’m paying a premium, I need to be assured that quality will be delivered. This year, I wanted a smaller bird and so I went the easy route. Yes, I do feel a bit guilty for not buying totally local when I can, but I decided to give myself a break. I am much happier with a completely fresh, free range bird which weighs about 12 pounds. I will be stuffing the bird with herbs and fruit, and covering it with butter and bacon, which is a family tradition, passed down from my Grammie. 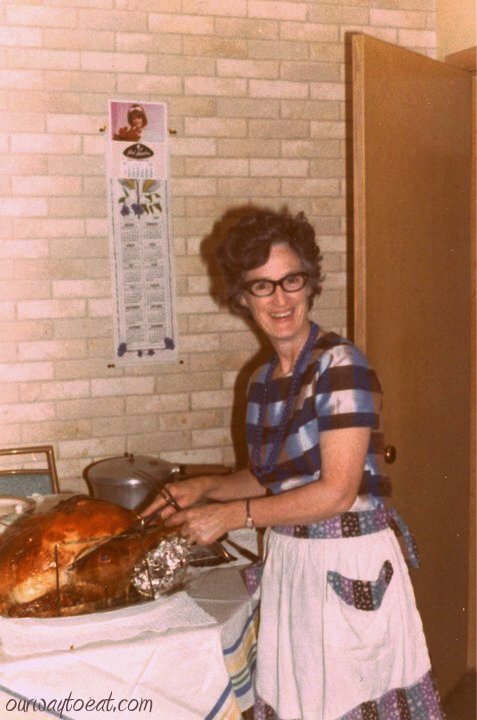 Grammie roasting a huge turkey topped with bacon. Look at that Golden Bird! 15. Even though I used an electric roaster and crock pot, the oven was packed. I’m planning fewer dishes this year so we should have oven space to spare. 16. We will set the table using our Mikasa Cameo Platinum wedding china. It is simple and clean-looking, and I love it. This year, we have the full set including gravy boat! I am going to warm up the table decor a little bit this year, more candles, more colour, though the plated food will remain the focal point. 1. Get a load of that plate of food! You will note that we enjoy both traditional cranberry sauce made by my mother-in-law, and jellied from a can. We also are so very fortunate that my mother-in-law and Bjorn’s Grandma make lefse together. My Dad and Grandfather were born in Norway, but they moved to Canada without packing their traditional Norwegian recipes, so I am pretty pleased to have married into a family in which the lefse-making tradition is going strong. I have had a lesson from Bjorn’s Grandma, and I will share that some time. 2. Mashed potatoes topped with chopped chives. I dried tons of herbs from our garden which I will use in Thanksgiving dishes and throughout the winter. This is a meal where I splurge on fresh herbs, though hopefully never again after this year, since I’m planning to plant a little indoor herb garden soon. They make everything look great and they add wonderful flavor and color that I love to see on our Thanksgiving table. 3. “Don’t drown your food” was a catchphrase from educational children’s public television. That message sunk deep into my brain. This is the one time of year I ignore it. To me, pumpkin pie is only to be served with a mighty dollop of sweetened, freshly whipped cream. 4. What is my key to a stress-free Thanksgiving? Say “yes” when people offer to bring things, especially things you aren’t good at making. I have never in all my born days baked a pie. If we’re lucky, maybe I never will. Thanks Mom! 5. The table looks festive once it is covered in an array of platters topped with appealing, sumptuous Thanksgiving standards. We’re ready to dig in! 6. Another impressive plate of food, this one topped with the brined, roasted turkey. You can see the lovely roasted golden beets on the right of the plate. They will be making an appearance again at our Thanksgiving table this year. 7. My immediate family, from left to right, my Mom, mother-in-law; brother-in-law, Dad, father-in-law and my darling Bjorn. 8. Another view of the table, close enough to see the roast turkey, carved and arranged by Bjorn, and a gorgeous platter of carrots and parsnip covered in herbs. 9. We have a buffet in our dining room which holds the dinner-table overflow. Here, wine bottles are ready to top-up our glasses, dressing stays warm in the crock, and scalloped corn and turnip puff are ready to be devoured. 10. My Mom’s homemade pumpkin pie. Pumpkin pie for Thanksgiving is a homey tradition we can’t do without and her pie hits the spot. 11. The men all managed to nod off for a well-timed nap right after the meal was over. I have to wonder if tryptophan is the cause, or if they’re employing well-timed dish-washing avoidance strategy?! 12. Later in the day we manage some how to get hungry again. We set a less formal table with sandwich fixings and haul out the turkey platter. 13. We round out the turkey sandwich meal with salty snacks and cookies that my Mom and Val bring. We’ll have a full-fledged Leftovers Meal tomorrow. We have so much to be thankful for and we are so truly grateful, wishing you and yours a wonderful Thanksgiving week.